I think Sebastian Junger's book, aptly titled War is the fourth book that I have read --this year-- concerning the American military (or private contractors) campaign's in either Iraq or Afghanistan. (The Others being: Generation Kill, Imperial Life in the Emerald City and of course, Blackwater) War --the concept not the book-- has always been a fascinating subject, mostly because it throws moral constraint out the window and man regresses to his most primal nature. War as a work of non-fiction examines this notion of war as a reduction to who can kill more effectively or rather who fights better. Junger does an admirable job of expanding upon this simplification of the concept, by examining the psychological aspects of war and the inability to function in a work devoid of combat. 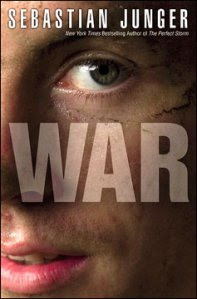 It is the examination of the psychological aspects of war that is the most compelling piece of Junger's research. He cites numerous studies undertaken to understand why a soldier is "heroic" (Such as jumping on a live grenade) or how morale affects infantrymen in the Army's pursuit to create the perfect soldier. For me, the war in Afghanistan presented in this book is a futile one (in terms of objectives and purpose)... What exactly is the United States Army hoping to accomplish in Afghanistan? Arguably, the world's greatest army fighting over various valleys while the nation's citizenry is left wallow in the turmoil. This is an over-simplification of the conflict but --honestly-- the soldiers in the book do not accomplish anything. Roads are not built nor are buildings restored and an active insurgency definitely is the reason for this. I suppose this is the point of War... The book and the concept. War is the futile act of violence... Man versus Man. It cannot create but only destroy, this point is lost through political discourse and the imposition of ideology in this nation. Is it any wonder that Afghanistan was considered the forgotten war? Regardless of one's position on war ideologically, it was a good read. Addendum: There have been some developments in the Afghan theater of the "War on Terror" (aka the War on Abstract Concepts), we finally have "compendium of 91,000" about what exactly is happening in Central Asia by our government. I highly encourage you all (my dwindling audience) to peruse the Afghan War Diary 2004-2010 at Wikileaks.org.